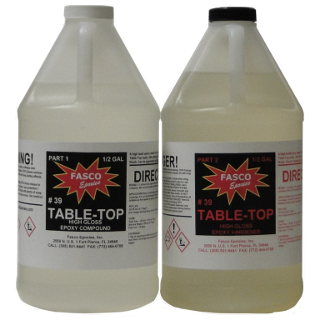 Not all table top epoxies are created equal. 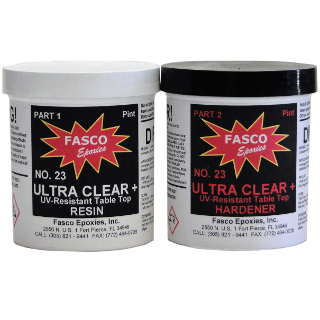 This Ultra clear has been specially formulated to withstand the harsh UV. Its been used by DIYers and the Pros for over 40 years. High build coating for decorative panels, bars, table tops. Comes in Quart kits and Gallon kits. 1 gallon of mixed epoxy contains 231 cubic inches of volume; therefore will cover approx. 1.6 square feet at 1 inch thick and approx 6.5 square feet at ¼ inch thick. Coverage must include surfaces, edges, and an extra 2% for run off on the edges. SURFACE PREPARATION: Although it is not possible to address every type of surface the following is a generic guideline: Bare wood should be sealed with a thin coat of epoxy, decoupage articles should be tested for color fastness prior to application. When recoating an existing coating the coating should be scuff sanded and cleaned with a cleaning solvent. Denatured Alcohol or Isopropanol 99% are recommended. Be sure that the surface and the epoxy to be mixed are at the same temperature. Preferably 75-85 deg. F.
MIXING: Mixing is the most important part of the project. Improper mixing will cause soft or tacky spots in the surface. First be sure you are preparing to mix containers of Hardener and Resin, believe it or not mistakes happen, check the labels. Graduated mixing containers are recommended for measuring and mixing. Hand mixing with a paint type stir stick is recommended, mixes should not exceed 1.5 gal. Continual mixing including sweeping the sides and bottom of the mixing container while mixing should take approx 3 minutes. The product may cloud a little during mixing but will clear as mixing nears completion. It is important to mix without inducing air. After mixing is complete, allow the mix to stand 3-5 minutes and remix for approx. 30 seconds. The completed mix should then be poured into a separate container for the final pour. The reason for this is that no matter how complete the mix is, there are unmixed portions on the sides and bottom of the mixing container. APPLICATION: Epoxy is self leveling, therefore the surface must be level for uniformity. The epoxy may be poured on the surface and spread with a plastic hand squeegee or a dust free foam brush. It is not recommended to apply more than 1/8 in” Thick per coat. Thick films are achieved through multiple coats. Once the epoxy is applied to the desired thickness tiny air bubbles will appear on the surface. The bubbles need to be eliminated by passing the flame of a propane torch systematically over the surface keeping the flame at least 3 inches from the surface. The same technique can be used with a heat gun. It will be necessary to repeat this process until the bubbles stop surfacing. You will now have a glass like surface. CURE TIME: Cure times will vary with temperature and thickness. 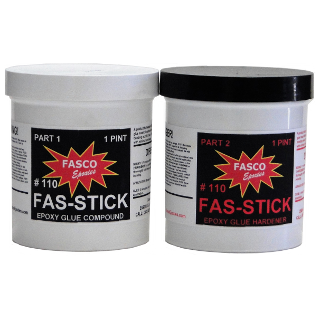 Fasco 23+ will be tack free in a 1/8 in film at 77 deg. F in approximately 8 hrs.and ready for service in 24 hrs. Important note: Even though the film will appear hard the epoxy will not reach full cure for 14 days. Therefore, do not leave objects on the surface until fully cured. When used for bars or table tops any hot items like coffee cups hot plates etc.over 140 deg. 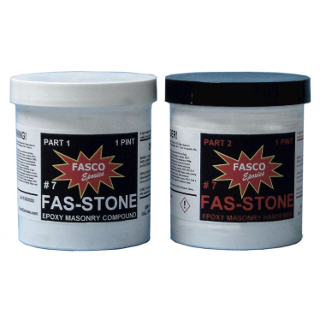 F will leave a ring or impression on most any epoxy. The use of saucers under cups and heat resistant pads under hot plates are recommended to preserve the finish. 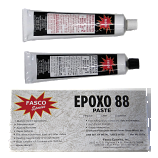 IMPORTANT NOTES ABOUT EPOXY: Epoxies cure through chemical reaction. The chemical reaction generates heat, the greater the mass of epoxy the faster the reaction occurs. Pot life is measured with about 4-0z.Of epoxy @ 77deg.F.Therefore a stated 40 minute pot life is for those 4 ounces. 1.5gal mixes in a bucket will only have a 10-15 min pot life. 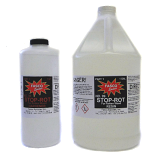 Epoxies will amber slightly when exposed to sunlight, even for only several hours and will chalk in exterior applications. For exterior application a topcoat with a UV inhibited Urethane is recommended. Blemishes caused by contaminants or suicidal insects can be sanded out and recoated without ruining clarity. If this is your first experience with Epoxy-EXPERIMENT ON A SIMILAR SURFACE before making a big mistake.